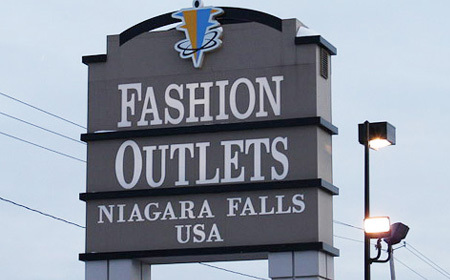 Fashion Outlets of Niagara Falls, USA is conveniently located just ten minutes from the Niagara Falls State Park. The property size is nearly 700,000 square feet making it one of the largest outlet malls in the country. Fashion Outlets Niagara Falls USA is a major destination for shoppers in New York and eastern Canada. It is a single level indoor outlet shopping experience featuring over 200 designer outlets offering great savings of up to 75% off every day. Fashion Outlets of Niagara Falls is anchored by Saks Fifth Avenue OFF 5TH, Forever 21, Nike Factory and Marshalls and is home to world-class brands like Burberry, BOSS Outlet, Coach, Cole Haan, Disney, Kate Spade NY, Michael Kors, Polo Ralph Lauren, Tommy Hilfiger, Under Armour, Vera Bradley, Victoria’s Secret and more. Conveniently located just minutes from the falls and Niagara Falls State Park, casinos, international bridges and many other local attractions. Get complete information about the attractions & things to do attractions & Things to do in Niagara Region. Abundant Parking spaces are available. These spaces are located in a lot adjacent to Fashion Outlets Boulevard just outside Saks Fifth Avenue OFF 5TH.